The Gadget: Linksys' slightly fancier Windows Media Center Extender, which streams the Windows Vista/XP Media Center interface over the network so you can watch live or recorded TV and downloaded files on TV in HD. The Performance: Fantastic. We were able to stream live 1080i over-the-air (OTA) HDTV with no glitches for the most part, and whatever glitches we did see were due to the fact that OTA reception in our area isn't great and we had a small antenna. But when we watched pre-recorded content in both 720p and 1080p, there were zero glitches or dropouts. We tested this both with the wired internet and the Wireless 802.11N network via Linksys's WRT600N Router, and it was super smooth even over Wi-Fi. 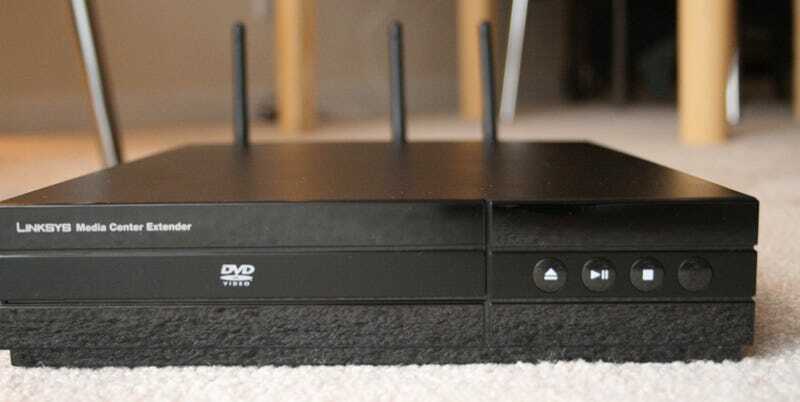 Its DVD playback was fine, and is convenient if you want to use this in a spare guest room or a bedroom to stream HDTV off off without hooking up HDTV connections or getting another DVR. The DVD is just a bonus. Also, this extender handles XviD files (but not DivX), meaning you can grab TV shows you missed off of BitTorrent and watch them as well, without having to transcode anything. The Verdict: Did the extender do everything it promised to do and do it well? Definitely. Streaming perfect HD over 802.11n Wi-Fi isn't a small feat, and doing so when supporting XviD and DVD playback is impressive as well. But is it worth $299 when you can get an Xbox 360 that does pretty much the same thing for the same price? Yes, if you want 802.11n Wi-Fi streaming and XviD playback inside the Media Center interface. If not, then you're better off getting an Xbox 360 and getting gaming out of the deal as well.